Today, on the birth anniversary of Dr. Sarvepalli Radhakrishnan, erstwhile vice-president of India, the country celebrates Teachers’ Day. Like Mothers’ Day or Fathers’ Day, Teachers’ Day sees current and former students either evincing their happiness, good fortune and good memories with their “second parents”, or slamming the pedagogy outright. There are yet others who are indifferent to the whole idea of recognizing this much extolled profession. I bid my farewell to the place I called my “second home” – for a dozen years – five months ago, and I never left with a head full of Physics, Chemistry and Biology lessons; I left with a plethora of life lessons, a lot of them concerning the teacher-student relationship. The opinions and attitudes of students regarding Teachers’ Day undoubtedly stem from their relationships with their teachers. So, I thought I could enumerate a few pointers on how to build a healthy relationship between both parties while addressing the problems that make the rapport unpleasant. We’re all composed of hearts, minds and souls, not circuits, nuts and bolts. It is a common misconception that teachers ought to be equipped with the answer to every statement that ends with a question mark, and that every student ought to know the study material like the back of her hand, but logically, that’s impossible. Teachers and students are both susceptible to making mistakes, but one or the other should not be branded as “unqualified” or “unfit” on account of the same. When lack of knowledge is humbly admitted and mistakes are gently rectified, the rapport between the teacher and the learner is enhanced. Another fallacy is that teachers are like gods, or worse still, that teachers are gods. The simile and the metaphor are both incorrect. In ancient India, when the Gurukul system was in effect, gurus were given a lofty niche on account of their wisdom, knowledge and understanding. When I was a schoolgirl, there was a misconstrual that a teacher is “like God”, and that he or she “is God in a way”. A couple of years later, I happened to read an article on the guru-shishya (teacher-disciple) relationship that rubbished the God-equation. God is the source of all knowledge, and teachers are instrumental in the giving of that knowledge. Although I grew accustomed to it, I strongly disagreed when I heard teachers say things like, “You spend more time at school than you do at home, so you spend more time with your teachers than with your parents”, “We know you better than your parents”, or “Can your parents look after 60 children?”. Sometimes, it is essential for teachers to reconsider their role: they are called “second parents” not because they replace a child’s real parents, but because their role is complementary to that of the parents. Addressing the question about “60 children”, I’ll admit that teachers are indeed tasked with maintaining discipline and satisfying the educational needs of a lot of children, but that doesn’t imply that parents are without a care in the world. From a logical perspex, it is the parents that feed and clothe and lodge the children while funding their curricular and extra-curricular activities. So, teachers and parents should cultivate a mutually respectful and a symbiotic relationship. Sometimes, students find in their teachers a friend and a counselor with whom they can share their highs and lows and everything in between. This is fine, so long as there is a certain level of discretion as regards to disclosure. It is alright for the class to tell the teacher what each one does for pleasure or in leisure, share personal experiences that molded them or confide their personal struggles. However, the teacher and the student should respect the professionalism of the relationship by knowing when and where to draw the line. Stalking social media profiles and prying into personal affairs should be avoided at all costs. Also, when divulging personal experiences, be honest, but not long-winded. If a student wishes to tell her teacher that she is finding her studies difficult because her parents have recently divorced, she should say just that – not launch into the details of how and why. Teachers too, when discussing their backgrounds, should not launch into vivid details about their romances and their married life. Students should not spin yarns about teachers in the classroom and neither should teachers about students in the Staff Room. Gossip and rumor-mongering is an act of disrespect and violates the purpose of education. Should an issue arise among two members of staff, a group of students, a student and a teacher or any other permutation and combination of the kind, it should be directly dealt with – and as quickly as possible – instead of being viciously circulated by word of mouth, whereby more damage can be caused to persons and reputations than the original action or conflict itself. And just because a student is in a teacher’s bad graces or vice versa, one should not readily lap up the negative things said about the person concerned. Sadly, many “developed” places and “cultured” people are still roiled by distinctions made and privileges being allotted on the grounds of caste. Casteism is offensive, but even more so when those sentiments are nurtured in a school. For instance, when I was a student in an “Anglo-Indian” school, folks used to imply (not necessarily directly) that the Westerners are the epitome of immodesty and Indians are paradigms of the opposite. As a result, it was made mandatory that braids should be folded on regular working days, and on our Valediction Day, we were told that dresses are forbidden, and “only Indian attire is allowed”. Not only in my school, but in others also, I would hear stories of people of a certain caste being stereotyped by teachers as “cunning” or “cheap”, and students too had retorts like “uncultured” and “they belong to such a community, so you can expect nothing better from them”. Students and teachers should therefore learn to see each other through a lens that is not fogged with prejudice to maintain a healthy rapport. Correction and grooming are essential to the shaping of a child’s character, but correction loses its effectiveness when it is coupled with humiliation, or worse still, when it is mistaken for it. When a teacher corrects a child, she should remember that her purpose is to better, not to belittle. Similarly, when a teacher commits a mistake or a faux pas, it should not be turned into a joke that can be brought up at any time and laughed at. Humiliating a teacher causes the respect of her subordinates to wane and it puts her up for ridicule, while belittling a student can be detrimental to her self-esteem. I knew a certain teacher who used to comment on the body odor of adolescent students just so she could sell them branded deodorants and perfumes and the only thing more offensive than body odor became the teacher’s mannerism and approach. The relationship between pedagogue and pupil should be built on mutual encouragement rather than humiliation that can kindle negative sentiments. Maybe a teacher wears oversized jewelry or mismatched clothing; maybe a student posts some pictures at a house party in a crop top and shorts. The aforementioned incidents are not excuses for the student to judge the teacher as a tatty person or the teacher to judge the student as being provocative. Teachers are meant to teach and students are meant to learn, neither is meant to judge. If the student finds fault with the teacher, the direct approach works best. She could just say, “I don’t mean to be rude, but your jewelry is very distracting” or the teacher could say “I understand that you’re young, but I would advise a little caution”. Judgment creates bigger problems, but understanding solves them. My Linguistics Professor once told us, “I’ll never know everything. I’ll be learning all my life” and my French teacher from back in the day told me a few hours ago, “You have taught me more than you know”. Students remember fondly the times teachers tell us that they learn from us. It is humbling, I feel, because I sometimes wonder what we as youngsters teach them that they do not know. Role-reversal should not be mistaken for attempting to outsmart the teacher as that comes across as harboring feelings of superiority. On the teacher’s part, she should be willing to accept that she is not beyond learning from the children she teaches. Role-reversal also helps both parties gauge the efficiency of their teaching and grasping strategies. Teachers can be pretty, in vogue and open-minded, but it is to be remembered that they are teachers and not celebrities. Going gaga over a teacher is a strict no-no as it is unhealthy and inappropriate and can lead to potential misunderstandings and wrong impressions. It is alright to pay the teacher an occasional compliment if you like her, but be genuine, because flattery and infatuation aren’t hard to detect. Look up to a teacher for her good qualities and her skills. Remember that how she looks does not necessarily factor into her personality. My French professor, for instance, is a prim, poised, pretty, pointed-nosed thing, but that’s not a concrete reason to admire her (although I admit we do a little bit); the real reason is because she admitted to being a simple, smalltown girl who has worked hard to be where she is today. So, conduct befitting both a teacher and a student is called for if the classroom and the school milieu are to be places that foster learning in the right way. 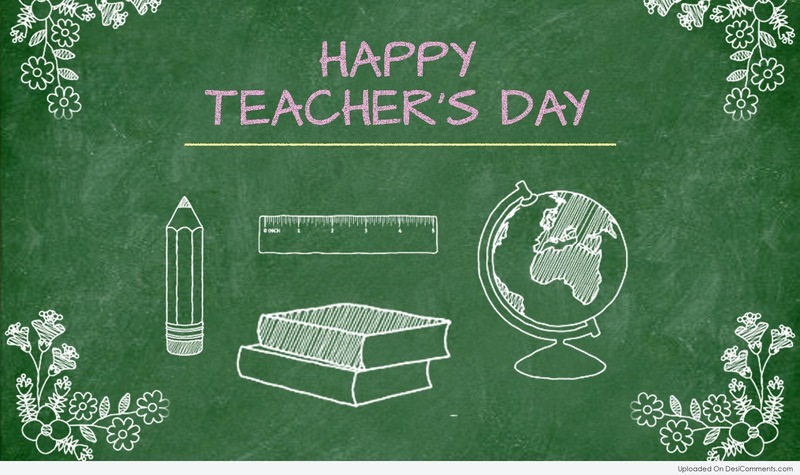 Teachers are as different as can be: some are like sugar and spice, while some are not so nice, but to all those amazing men and women with marker-stained hands and chalk-dusted hair who have been an integral part of our lives, here’s to you. Happy Teachers’ Day! Atta girl! Keep going…proud of you!! !